The GV Convergent IP/SDI router control and configuration system transparently manages facility routing as the industry migrates from SDI to IP infrastructures, maintaining familiar control interfaces as well as introducing intuitive new GUIs for configuration, management and control. GV Convergent is both infrastructure and signal format agnostic for easy system scalability for your system today and far into the future. GV Convergent is based on open protocols, standards and platforms, encouraging interoperability, and has been designed to be infrastructure agnostic, working with commercial off the shelf (COTS) IP switches as well as SDI routers from Grass Valley and other manufacturers. The system works with a wide variety of hardware and software panels, commonly used today, as well as platform agnostic GUI interfaces. Switching is controlled either by software defined networking (SDN) or via IP endpoint control. 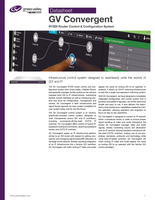 Intuitive Control of COTS IP Switches and NVISION SDI Routers. Annual Software License. (1 required per GVC controller). Allows for software updates for 1 year from date of purchase. The GV Convergent IP/SDI router control and configuration system from Grass Valley, a Belden Brand, transparently manages facility routing as the industry migrates from SDI to IP infrastructures, maintaining familiar control interfaces as well as introducing intuitive new GUIs for configuration, management and control. GV Convergent is both infrastructure and signal format agnostic for easy system scalability for your system today and far into the future. The NVISION panel series from Grass Valley, a Belden Brand, includes a wide range of highly adapted panels for superior control. The panel range includes informative and easy to use LCD relegendable panels, multidestination panels, multimode button per source panels, destination/source (XY) panels and the powerful RCP-200 smart panel. The NVISION panel series is the most comprehensive line of panels, meticulously designed to optimize various workflows for the fastest, error-free operations as well as accommodating tight budgets and restricted space requirements. Panels can be used with both the NV9000 and GV Convergent control systems.